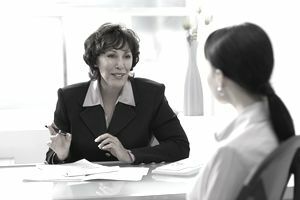 Before you begin interviewing, it is critical to have a written job description in place for each unique position. Having a written description accomplishes many important things that protect your business and your employees. Job Title: clarifies the position, job title, and rank or level (if applicable). Statement of Purpose and Objectives: a general statement, summarizing in three or four sentences, the purpose or objective of the position. Job Description: a detailed list of specific duties and tasks in their order of significance (the most important duties should appear at the top of the list). This list should cover every activity that will take 5% or more of the employee’s time and include any accountability the employee may have for meeting certain objectives. Description of Reporting Structure: this section provides a detailed description of any and all roles the employee will hold. It should include their own supervisory roles (if any) as well as who they are subordinate to directly and indirectly. If the employee is to work with other employees or departments, include that information as well. Experience and Skills: be as specific as possible when detailing the experience and skills required to perform the job. For example, if the position requires the use of a computer, list the type of software or hardware used to perform the job. Work Location and Schedule: list the physical location of the job, the days and hours of the position, and include any potential overtime that may be required to perform the job.